Judith Arlene Resnik was born in 1949 to Sara and Marvin, an optometrist, in Akron, Ohio; her brother Charles was born four years later. She attended Hebrew school. A graduate of Firestone High School in 1966, she excelled in mathematics and played classical piano. While at Firestone she achieved a perfect SAT score, the sole female to do so that year. She received a B.S. in electrical engineering from Pittsburgh's Carnegie Mellon University in 1970, the year she married fellow student Michael Oldak They divorced in 1974. In 1977 Resnik earned a Ph.D. in electrical engineering at the University of Maryland. Upon graduation from Carnegie Mellon, she was employed at RCA as a design engineer, and later worked with various NASA projects contracted to the company. While working toward her doctorate, Resnik was affiliated with the National Institutes of Health as a biomedical engineer. Later, she was a systems engineer with Xerox Corporation. Resnik was recruited into the astronaut program January 1978 by actress Nichelle Nichols, who was working as a recruiter for NASA. Resnik's first space flight was as a mission specialist on the maiden voyage of Discovery, from August to September 1984. She was likewise a mission specialist aboard Challenger for STS-51-L. Resnik was the first American Jewish astronaut to go into space, the first Jewish woman, and only the second Jew to go to space (after Boris Volynov of the Soviet Union). For people accustomed to seeing images of astronauts in space, Resnik's first space mission still caused some notoriety. 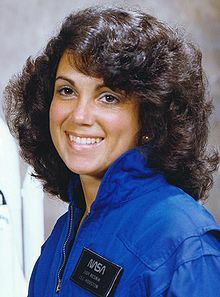 Not only was she one of the first women in space, but in weightlessness, she displayed a halo of flowing locks, a startling sight to many viewers who were accustomed to seeing closely cropped men. During the flight, she was acclaimed for her weightless acrobatics and a playful sense of humor, once holding a sign reading "Hi Dad" up to the camera, and displaying a sticker on her flight locker that advertised her crush on actor Tom Selleck. Following the Challenger disaster, examination of the recovered vehicle cockpit revealed that three of the crew Personal Egress Air Packs were activated: those of Resnik, mission specialist Ellison Onizuka, and pilot Michael J. Smith. The location of Smith's activation switch, on the back side of his seat, means that either Resnik or Onizuka could have activated it for him. This is the only evidence available from the disaster that shows Onizuka and Resnik were alive after the cockpit separated from the vehicle. However, if the cabin had lost pressure, the packs alone would not have sustained the crew during the two minute descent. Since her death, Resnik has been awarded many posthumous honors. Numerous public buildings and facilities have been named after her, mostly schools and educational facilities, including a dormitory at her alma mater, Carnegie Mellon, and the main engineering lecture hall at the University of Maryland. The IEEE Judith A. Resnik Award was established in 1986 by the Institute of Electrical and Electronics Engineers and is presented annually to an individual or team in recognition of outstanding contributions to space engineering in areas of relevance to the IEEE. She was also honored by the naming of lunar crater Resnik, located within the Apollo impact basin on the far side of the Moon. Resnik has been portrayed in numerous works of nonfiction and fiction, including the 1990 made for TV movie Challenger in which Julie Fulton portrayed her. On February 23, 2010, she was named one of ten finalists to represent Ohio in the National Statuary Hall in the U.S. Capitol in Washington, D.C.
Resnik has many streets, schools, community centers, and other structures named for her in numerous locations.